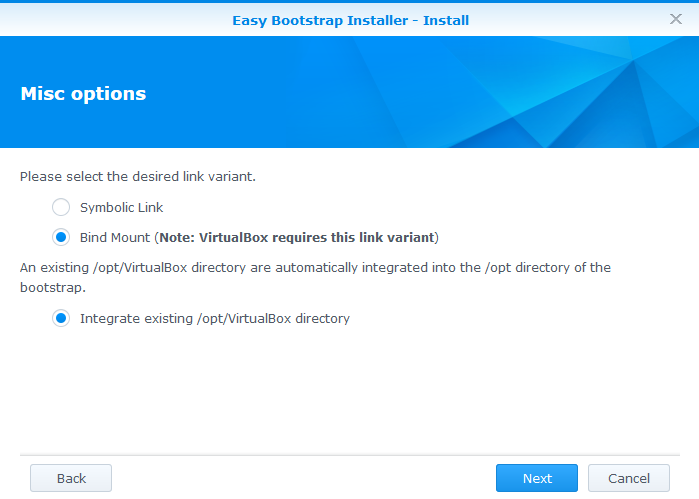 With a few mouse clicks you can set up a bootstrap for your Synology DiskStation or Router. Depending on availability for the particular model it can be chosen between Optware(-ng) iPKG® or Entware oPKG. The bootstraps offered by the DiskStations for the Entware-ng were converted to Entware. Only models based on the architecture 'evansport' kept the old Entware-ng, since Entware is no longer offered for x86-32. The installation for Entware-ng has been adjusted and is now running faultless. - added: Support for DSM 3.2 or higher, this is a complete installation with scaled-down wizard functions, because in DSM < 5.0 a essential wizard function is missing. due to this limitations of the package center the availability of a bootstrap and other checks can only be performed after confirmation of the summary (preinst). - Besides the manual installation of Optware-ng an installation of the ipkg package is additionally performed by the package manager so that an update of the package manager will also be displayed. This will also be fixed by updating the package, a new installation is not required. - fixed: Installation could not be performed because of a special character with an incorrect encoding. This only affected users, where the installation was displayed in english. Hint: The installation takes more time than any other bootstrap, because the locales have to be generated after installing. - added: Specific support for VirtualBox - whether installing or uninstalling, the VirtualBox folder will remain until you uninstall VirtualBox. - added: User selectable deactivation (not removal) of nearly all old bootstrap types before the installation is performed. The package manager source directory (@optware or @qnapware) will be renamed, all other configuration files are removed. - Installation is now possible if a folder or symlink /opt or /volume(x)/@optware exists and don't owned by a active package manager. With a user selectable option the existing /opt or /volume(x)@optware will be integrated into the package manager directory or renamed to opt_#timestamp# resp _optware_#timestamp#. can't install on a ds216play. I have DS918+ (architecture 'apollolake') and when I try to install Easy Bootstrap 0.4-036 I have: "Sory, no bootstrap for your DS918+ currently available!" Why??????
" ipkg: command not found"
I found your Bootstrap Installer after I had already installed Entware-ng using the directions from here: https://github.com/Entware-ng/Entware-ng/wiki/Install-on-Synology-NAS. The problem I have with the github version is it does not handle shutdown scripts, just startup. Does your installation handle both Startup and Shutdown? I assume it is different as it did not pickup the fact I had installed Entware already. The same on DS716+. I click Next on license agreement page and nothing is happening.